Cardiff moved to within three points of the Championship play-off places courtesy of a win over 10-man Reading. It was a miserable night for Royals defender Alex Pearce, whose own goal gave the home side the lead. The 26-year-old was then sent off for a trip on Adam Le Fondre in the box that allowed Peter Whittingham to double City's advantage from the penalty spot. Michael Hector's late strike gave the 10 men of Reading hope of a point but Cardiff held on for the victory. The win is the Bluebirds' second in five games and their fifth in a row at home. The Royals remain without an away win since a 1-0 victory at Middlesbrough on 30 August, with them losing six of the last seven on the road. They were always up against it from the moment Pearce was shown a straight red for his foul on Le Fondre just before half-time. The Royals already trailed after Pearce had accidentally deflected Whittingham's cross into his own net, and the Cardiff midfielder made the away side's task even harder by firing his spot-kick past Adam Federici. However, Nigel Adkins' side battled back and were rewarded when Hector's low drive found its way into the goal through the legs of home goalkeeper David Marshall in the 81st minute. But Cardiff, assisted by their numerical advantage, were able to see out the remainder of the game to move up to 11th in the Championship table, three places and five points ahead of their opponents. 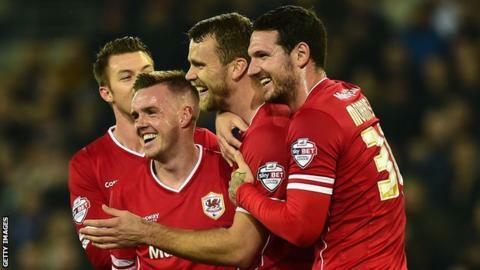 Match ends, Cardiff City 2, Reading 1. Second Half ends, Cardiff City 2, Reading 1. Offside, Cardiff City. David Marshall tries a through ball, but Anthony Pilkington is caught offside. Nick Blackman (Reading) is shown the yellow card. Nick Blackman (Reading) has gone down, but that's a dive. Jake Taylor (Reading) wins a free kick in the attacking half. Foul by Ben Turner (Cardiff City). Attempt missed. Adam Le Fondre (Cardiff City) right footed shot from outside the box misses to the right. Assisted by Federico Macheda with a headed pass. Glenn Murray (Reading) wins a free kick in the attacking half. Corner, Cardiff City. Conceded by Adam Federici. Attempt saved. Mats Daehli (Cardiff City) right footed shot from a difficult angle on the right is saved in the bottom right corner. Attempt saved. Federico Macheda (Cardiff City) right footed shot from the right side of the box is saved in the bottom left corner. Assisted by Fabio. Goal! Cardiff City 2, Reading 1. Michael Hector (Reading) right footed shot from the centre of the box to the centre of the goal. Assisted by Jake Taylor following a corner. Attempt missed. Jake Taylor (Reading) right footed shot from outside the box misses to the right following a corner. Substitution, Cardiff City. Fabio replaces Matthew Connolly. Adam Le Fondre (Cardiff City) wins a free kick in the defensive half. Substitution, Cardiff City. Mats Daehli replaces Craig Noone. Offside, Cardiff City. Matthew Connolly tries a through ball, but Adam Le Fondre is caught offside. Corner, Cardiff City. Conceded by Michael Hector. Corner, Cardiff City. Conceded by Stephen Kelly. Attempt missed. John Brayford (Cardiff City) left footed shot from the left side of the box misses to the right. Assisted by Aron Gunnarsson. Attempt missed. Oliver Norwood (Reading) right footed shot from outside the box is high and wide to the right from a direct free kick. Attempt missed. Anthony Pilkington (Cardiff City) left footed shot from outside the box misses to the right. Attempt missed. Adam Le Fondre (Cardiff City) right footed shot from the left side of the box is close, but misses the top right corner. Attempt missed. Craig Noone (Cardiff City) left footed shot from outside the box is high and wide to the left. Attempt missed. Anthony Pilkington (Cardiff City) right footed shot from the left side of the box is high and wide to the right. Assisted by Craig Noone following a corner.